Women’s black open-toe sock bootie by Alexander Wang. Constructed with a stretchy nylon sock upper with rib-knit trim detailing, the ‘Cat’ boots feature a rounded open-toe design. 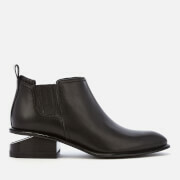 Set on a 3-inch wrapped heel with metal plate and post detail, the boots are detailed with a high-shine leather sole and a rubber overlay to the heel’s outsole for grip. Complete with a branded dust bag. Upper: 97% Nylon, 3% Elastane. Sole: Leather.